Young nature explorers from Reception Two tried their hand at pond dipping, bird watching and bug hunting as part of their project this term on habitats. The active and enthusiastic naturalists spotted whimbrel, turnstones and heron in the wetlands of Nature Seychelles. In the bird hide they learnt to use a pair of binoculars. Bug hunting using magnifying glasses was another popular adventure and the students all enjoyed pond dipping to see what wonderful creatures inhabit the wetland. . By looking carefully at their environment and talking about their experiences at the Sanctuary students continue to acquire knowledge and become inquisitive about the various eco systems and environments in their world. Moyenne island – Yo Ho Ho! 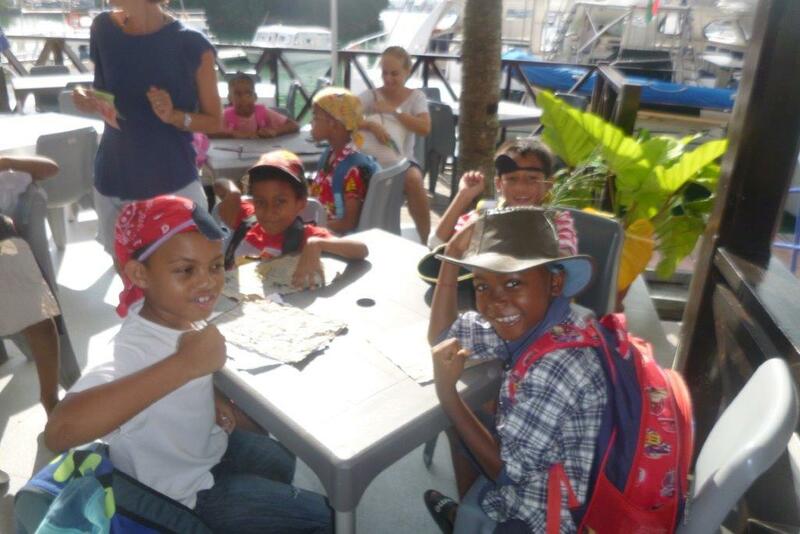 Year 2 students sailed off to Pirate Island on April 1st ready for adventure. Colourful costumes, hats, kerchiefs, swords, eyepatches and cutlasses adorned the young pirate adventurers. The Anahita Catamaran provided by Masons Travel took the 52 pirates to one of the inner islands which was previously owned by a friend of the school Mr Brendon Grimshaw. He and his companions had replanted endemic trees on the small island for visiting tourists and young pirates to enjoy. Our intrepid explorers landed on the island and met Yellow the friendly island dog who accompanied us on the island tour. On the way we had a brief stop at the look- out point to see if there was danger approaching! Further north on the tour the students looked for signs of treasure and found the tombs of unknown pirates “Unhappily unknown”! On the circular route the students were able to spot many endemic trees and bamboo plants and on arriving back where most of the giant tortoises hang out Ella discovered the treasure chest and shared the bounty with her friends! Everyone enjoyed games and frolics on the beach after a tasty picnic. Many thanks to Mason’s travel for providing the sailing boat and to parent helpers who supervised the children on the trip. 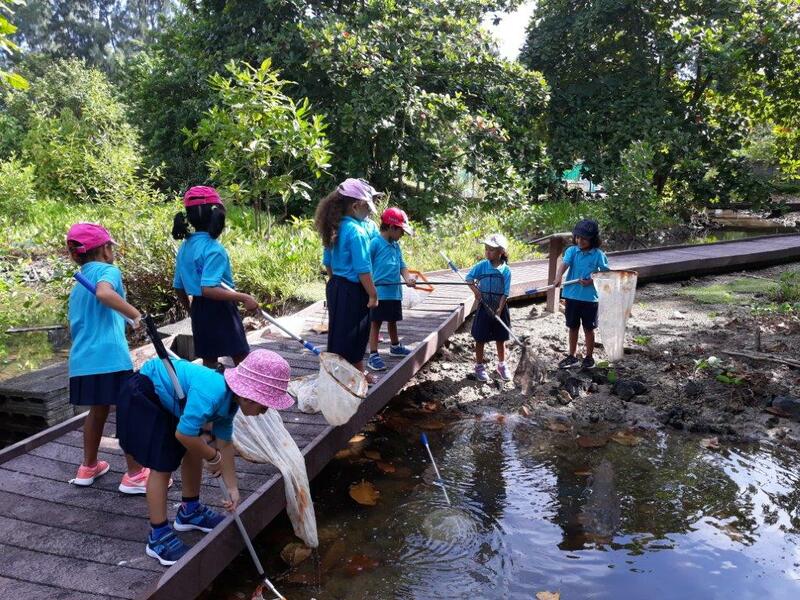 On a sparkling blue day in March the representatives of the biology, art, travel and tourism and English departments of the school joined the hard working Eco Club members on a special trip to Cousin Island. They all departed from the Marine Charter on the catamaran Catalina. The two-hour voyage across the flat seas passed Les Mamelles and Cousine en route and ended with us anchoring off the beautiful conservation island of Cousin. Some of the passengers spotted turtles and shoals of large friendly batfish while we waited to be transferred by the island tenders on to the granitic island of Cousin, a rat free paradise of unique ecological importance and the most important breeding site for Hawksbill turtles in the Indian Ocean. The fast beach landing was a first time experience for many students and staff. After dividing into groups of relevant study areas, the tours circumnavigated the island wandering in awe of the high lizard density, the giant Wrights skinks and rare bronze geckoes. Brown Noddies mating season had just begun and nests were rare as were the other Lesser Noddies. However tropic birds and their chicks were to be found at the base of most trees and fairy terns in various stages of development perched precariously on branches. 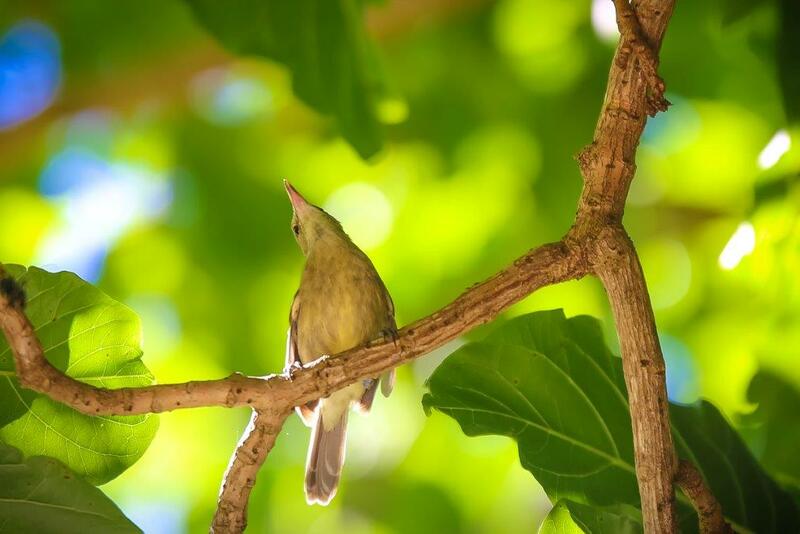 Students encountered the critically endangered Seychelles Brush warbler and Seychelles Magpie Robin and took some good photos. The students were amazed and very enthusiastic much to the rangers delight. The wild tortoises roaming the forest interacted as if they were hosting the visitors in a friendly manner. The islands resident swarms of mosquitoes were a constant annoyance and the sweltering temperatures sapped the energy of the exploring students who were glad to return to the breeze and shade of the beach crest to eat their lunch. They compared notes of what they had encountered. As a thank you to Nature Seychelles and Cousin island students picked up litter from the beach before departing for the return voyage. The intrepid students relaxed on the forward deck nets on the return trip. The final excitement was, as we approached St Anne Island, one of the two trailing rods bent double as we struck a large bonito. It lived to fight another day as it jumped the hook before being landed. We arrived at the jetty slightly late but contented. The students now have much inspiration for their upcoming exams and planned projects. Many thanks to Masons Travel and Cousin Island staff for making us feel so welcome. Maybe the trip will inspire our ISS students to work in conservation. What a busy, exciting and creative day for our Junior and Senior students spent celebrating the theatre arts for World Theatre Day 2019! All students who participate in weekly performing arts clubs with Ms Georgie at ISS, seized the opportunity today to work together on the stage at ICCS, in acting, singing and dancing disciplines. The annul Performing Arts show is just around the corner so many students are working hard developing the skills required to shine in the spotlight when they perform on Wednesday 17th April 2019. • To promote the art form across the world. • To make people aware of the value of the art form. • To enable the dance and theatre communities to promote their work on a broad scale so that opinion leaders are aware of the value of these forms and support them. • To enjoy the art form for its own sake. Please visit www.world-theatre-day.org for more information. Thank you teachers for your assistance and support in this event.